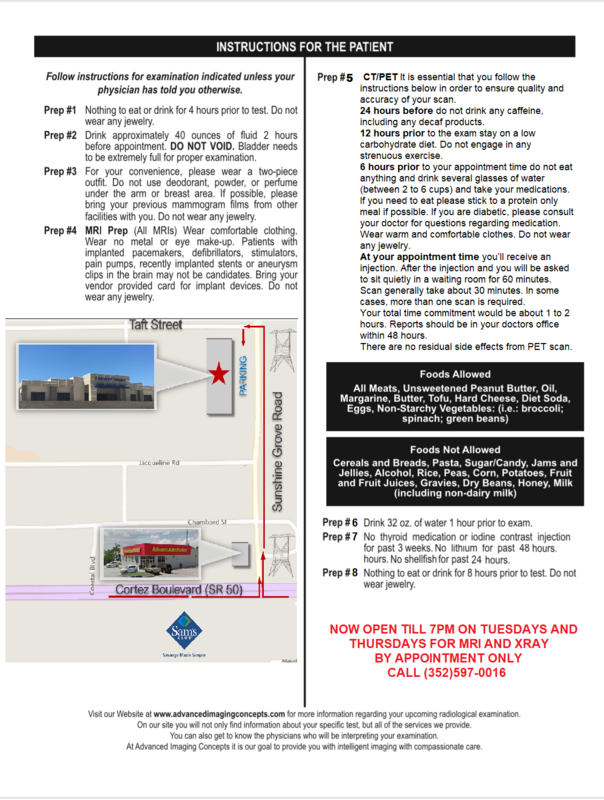 New Prep Instructions and Map (File size: 626,335 bytes) Note: The request form is in PDF format and requires Adobe Acrobat Reader. If you don't have Acrobat Reader you can download it from www.adobe.com. AIC script 2018 (File size: 1,449,809 bytes) Note: The request form is in PDF format and requires Adobe Acrobat Reader. If you don't have Acrobat Reader you can download it from www.adobe.com. mri and hippa pdf (File size: 407,180 bytes) Note: The request form is in PDF format and requires Adobe Acrobat Reader. If you don't have Acrobat Reader you can download it from www.adobe.com. New Patient Form Page 1 (File size: 225,923 bytes) Note: The request form is in PDF format and requires Adobe Acrobat Reader. If you don't have Acrobat Reader you can download it from www.adobe.com. HIPPA form 2 (File size: 117,756 bytes) Note: The request form is in PDF format and requires Adobe Acrobat Reader. If you don't have Acrobat Reader you can download it from www.adobe.com. AIC ABN (File size: 332,226 bytes) Note: The request form is in PDF format and requires Adobe Acrobat Reader. If you don't have Acrobat Reader you can download it from www.adobe.com. MANAGED CARE WAIVER-revised 07 2015 (File size: 64,022 bytes) Note: The request form is in PDF format and requires Adobe Acrobat Reader. If you don't have Acrobat Reader you can download it from www.adobe.com. DEXA FORM (File size: 230,680 bytes) Note: The request form is in PDF format and requires Adobe Acrobat Reader. If you don't have Acrobat Reader you can download it from www.adobe.com. XRAY FORM 18 (File size: 227,645 bytes) Note: The request form is in PDF format and requires Adobe Acrobat Reader. If you don't have Acrobat Reader you can download it from www.adobe.com. CT Questionnaire 18 (File size: 228,314 bytes) Note: The request form is in PDF format and requires Adobe Acrobat Reader. If you don't have Acrobat Reader you can download it from www.adobe.com. PIP PAPERWORK WITH MCW AND ABN (File size: 595,801 bytes) Note: The request form is in PDF format and requires Adobe Acrobat Reader. If you don't have Acrobat Reader you can download it from www.adobe.com.